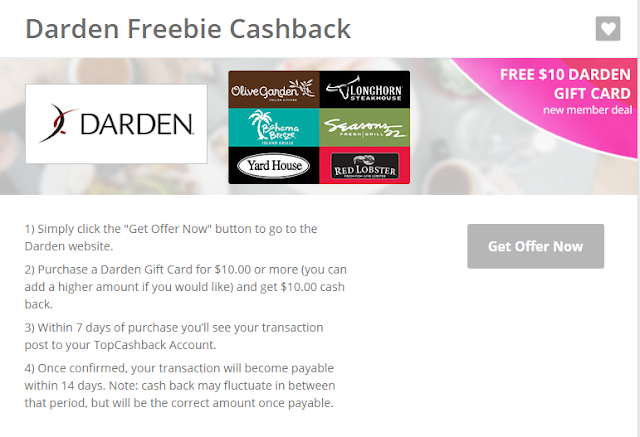 New Top Cash Back members can get a FREE $10 Darden Gift Card (can be used at Olive Garden, Red Lobster, Yard House and more). 1) Go HERE to sign up. 2) Then open a new tab and click this link HERE. 3) Click on "get offer now"
5) Within 2 weeks the $10 cash back will be in your Top Cash Back account, and you can then send it to your Paypal, checking account, or choose an Amazon gift card! I love Top Cash Back and can vouch for this deal! Plus, if you're already a member, you can sign up another adult living in your household with a separate email address! *Makes a great Teacher Gift for Christmas!